If you liked the Century Trilogy, you ll love the extraordinary . . . monumental masterpiece (Booklist) that changed the course of Ken Follett's already phenomenal career. 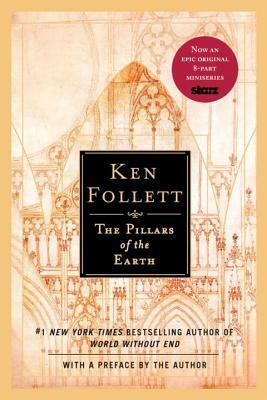 Follett risks all and comes out a clear winner, extolledPublishers Weeklyon the release ofThe Pillars of the Earth. A departure for the bestselling thriller writer, the historical epic stunned readers and critics alike with its ambitious scope and gripping humanity. Today, it stands as a testament to Follett's unassailable command of the written word and to his universal appeal. The Pillars of the Earthtells the story of Philip, prior of Kingsbridge, a devout and resourceful monk driven to build the greatest Gothic cathedral the world has known . . . of Tom, the mason who becomes his architect a man divided in his soul . . . of the beautiful, elusive Lady Aliena, haunted by a secret shame . . . and of a struggle between good and evil that will turn church against state and brother against brother. Ken Follettburst into the book world withEye of the Needle, an award-winning thriller and international bestseller. After several more successful thrillers, he surprised everyone withThe Pillars of the Earthand its long-awaited sequel, World Without End, a national and international bestseller. Follett s new, magnificent historical epic, the Century Trilogy, includes the bestsellingFall of Giants, Winter of the World, andEdge of Eternity. He lives in England with his wife, Barbara."